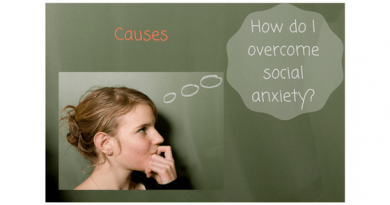 How do you manage anxiety attacks? 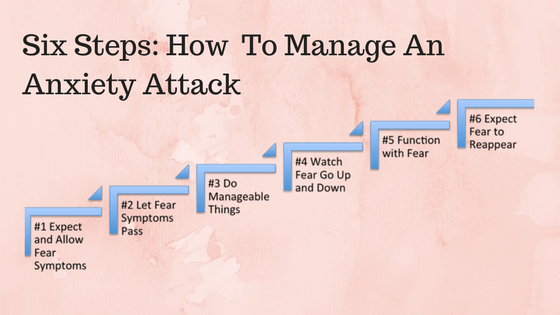 These steps were developed by Dr. Manuel Zane in his Six Points of Contextual Therapy For Phobia. These steps are most effective when you work with a professional who can explain these in greater detail and guide you through the steps (professionals such as Anxiety Clinics or Anxiety Coach). The Six Points have been developed to help you manage fear and distress. Alone, in the phobic situation, you focus on and react to unmanageable dangers, most of which are in the future and most of which won't happen - and especially won't happen if you use anxiety management techniques. This makes the fear worse. With the Six Points you learn to focus on and react to present reality. The Six Points have to be used over and over again to see for yourself how useful they are in coping, and eventually overcoming, fear. Point #1: EXPECT, ALLOW, AND ACCEPT THAT FEAR WILL ARISE. Because of past experiences, fear is triggered automatically by the phobic situation and by thoughts of it. Trying to fight fear only makes the fear worse, activates the intense physical symptoms, and leads to spiraling fear and panic. Point #1 shifts you from fighting panic towards accepting its inevitable appearance during your first few practice sessions. Once you begin practicing the Six Points, you will find that your panic goes away over time. But when you first start to practice, it's important that you allow the panic and symptoms to happen - don't fight them. That then allows you to go on to the next points. Point 2: WHEN FEAR COMES, STOP, WAIT, AND LET IT BE. Once fear arises, you usually expect the worst and automatically think about and prepare for anticipated disasters. This makes the fear worse. Point #2 seeks to slow or stop these fear-generating processes. By learning to wait, you discover that the expected dangers will not happen and that the panicky feelings will subside. The sooner you stop and wait, the faster the fear symptoms will go away. More effective ways of coping with fear and panic then become possible. Point #3: FOCUS ON AND DO MANAGEABLE THINGS IN THE PRESENT. Alone in the phobic situation, you concentrate on and react, to thoughts and imagery of dangers, most of which are not happening right then but you anticipate them. This involvement with future dangers makes fear worse and causes mental and physical stress. Point #3 guides you towards concrete, familiar activities in the present which lowers fear. These manageable activities may include talking, reading, writing, singing, counting, observing reality, snapping a rubberband on your wrist, feeling the textures of surfaces. taking a deep breath and exhaling slowly, and relaxing systematically. Point #4: LABEL YOUR LEVEL OF FEAR FROM O - 10. WATCH IT GO UP AND DOWN. To help you cope better and discover what makes your fear better and worse, you are encouraged to observe and study changes in your levels of fear. A level of 10 means that fear is judged by you as almost unbearable, and 0 means that it is absent. From these observations, you begin to realize that fear goes up and down and does not just run wild once it appears. Factors in your life, including your own thinking and activities, cause your fear to go up and down. When you monitor your fear, your fear then becomes less mysterious, and more manageable as it is more realistically understood. Also. you become able to communicate important aspects of your internal experience and therefore feel less alone and more hopeful. Point #5 FUNCTION WITH FEAR. APPRECIATE YOUR ACHIEVEMENT. You can function with anxiety. You can speak and perform with anxiety. We say this because many people with a phobia think they have to stop functioning once they see the first symptom of fear. You can function with some fear (you can speak even with fear symptoms). When you complete Point #5, usually through much hard work and practice, you will have changed considerably. The appearance of fear in the phobic situation no longer implies that panic and dysfunction must follow. Point #6: EXPECT, ALLOW, AND ACCEPT THAT FEAR WILL REAPPEAR. All learning, including learning to change phobic thinking and behavior, is always an up-and-down process. When you learned to ride a bike, you had good and bad moments, but overall you were developing skills and getting better. It's the same with overcoming a phobia. Setbacks must be accepted as part of learning; of getting better. Point #6 tries to prepare you for up and downs. As you learn to understand and cope with setbacks, you make progress. AnxietyHub.org was founded by psychologists. It’s a place to get accurate information about anxiety and stress. Some of the links on this site may be affiliate links. AnxietyHub is a participant in the Amazon affiliate advertising program designed to support blogs by earning advertising fees. 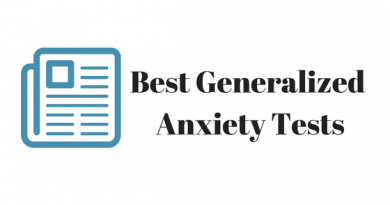 AnxietyHub reviews products independently and only links to products that our writers personally use and trust. If you purchase a product through an affiliate link, your cost will be the same, but AnxietyHub will automatically receive a small commission. Your support is greatly appreciated and helps us spread our message! Copyright © 2018-24 AnxietyHub. All rights reserved. Copyright © 2019 AnxietyHub. All rights reserved.